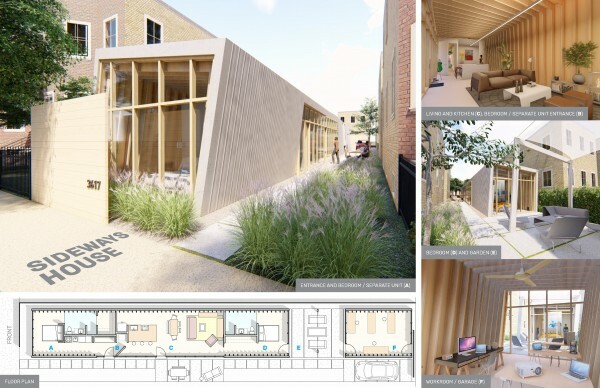 The Disruptive Design competition—an architecture competition seeking proposals for affordable housing in Chicago—announces today the three finalists moving on to the competition’s second phase. The three finalists were selected by five jurors from over 130 international entries in a blind jury process: Georgi Todorov, AIA, and Petya Petrova, IIDA; Joel Huffman; and Greg Tamborino, AIA, will each receive $10,000 to produce final designs and drawings before a winner is selected later this year. All three are Chicago-based architects. The competition, organized collaboratively by AIA Chicago, Neighborhood Housing Services, LISC Chicago, Chicago Neighborhood Initiatives and Northern Trust, originated to challenge architects to envision forward-thinking, viable solutions of building affordable housing under $200,000 (single family) or $300,000 (two-flat), and asked submitters to create single-family or two-flat homes within this budget. Submitters were also asked to include a wealth-building component to their designs, which could include a home office, flexible work space, or a rentable unit. The finalists' entries all create, “new versions of iconic Chicago-style housing,” said one juror. With two sites acquired—one double-lot in West Humboldt Park and another single lot in Bronzeville—jurors evaluated designs based on budget feasibility as well as designs that would fit into the context of these two diverse neighborhoods. Jurors were also interested in plans for sustainability, possible needs for zoning changes, and floorplans that enhanced quality of life. The first phase drawings will be presented to community members and alderman at each of the neighborhoods’ community meetings in the coming weeks, soliciting feedback from local residents. The City of Chicago's Department of Buildings will also review the final submissions and provide feedback for revisions. These finalists will refine their drawings based on juror feedback and present new drawings in late May. Todorov/Petrova's proposal, Urban Cabin, is for a contemporary two-story building, which is to be integrated seamlessly in the diverse context of both neighborhoods - West Humboldt Park and Bronzeville. The abstract exterior appearance would be respectful to the existing historical buildings while helping to revitalize these urban areas, enhance people’s experience, and raise property values. Efficient space planning would provide wide flexibility and convenient occupancy. We have focused on energy efficiency, high levels of insulation, and no thermal bridging. In an effort to reduce the overall monthly expenses for low-income residents, a sustainable and affordable model with low exploitation costs has been provided. We have approached this competition task not only as architects but also as product designers since we believe that this strategy has helped us to find a successful solution. 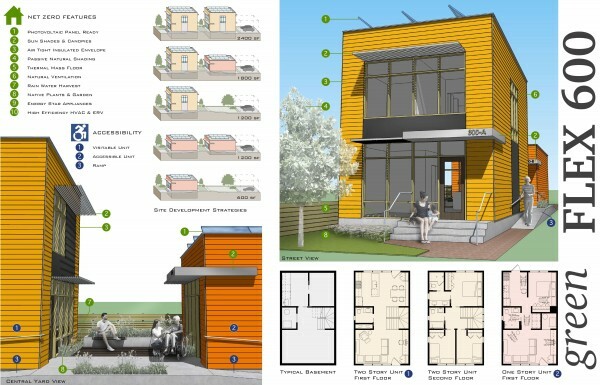 Green Flex 600 by Huffman is an affordable and flexible housing solution that features wealth building potential, green and sustainable building practices, and accessibility to the disabled and elderly. Specially conceived for this competition, this proposal yields a new typology for its site development strategies. Proposed lot densities include 600, 1200, 1800, and 2400 square foot realizations that will accommodate single first time buyers, small families, an accessory dwelling unit for rent, aging in place, or live/work, or a two family option. This flexible strategy allows the Green Flex 600 concept to adapt to the wide ranging needs and income levels of today’s families, as distributed across Chicago’s diverse neighborhoods that are in need of affordable housing solutions. Tamborino's Adaptable-House, titled as such in part because it reflects the spirit of an idealized homeowner who *adapts* to the challenges of life in pursuit of personal wellbeing. It also reflects the idea that our concept of housing must adapt to the various modern conditions of changing household demographics, of an aging population, of economic and technological change, of cultural shifts, and of a redefinition of workplace. The design of this home is inspired by the community for which it is intended to be built. 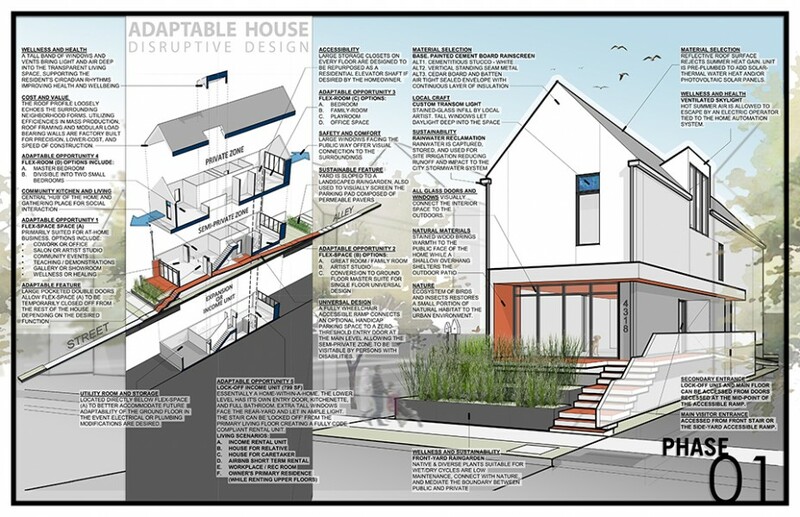 Housing is but one building block of a community and Adaptable-House is more than just shelter, though security is one of its essential considerations, and this proposal seeks to demonstrate one way the concept of a home might adapt for a specific set of economic, geographic, and cultural criteria. Characteristics of a house that such a homeowner may find valuable: Livability -- over time needs change and the home should adapt to changes in physical abilities such as a handicap or aging-in-place, current and future space needs as families shrink or grow, and the fact that financial situations may either be fixed or change significantly over time; a meaningful connection with nature and wellness -- access to light, air, views, sustainability, and thermal comfort. ; connection with the community -- appreciation for neighborhood context, a welcoming front to the street, maintaining wellbeing, dignity, health and safety of the residents; and cost -- low cost of entry with humble but quality materials with room to expand. 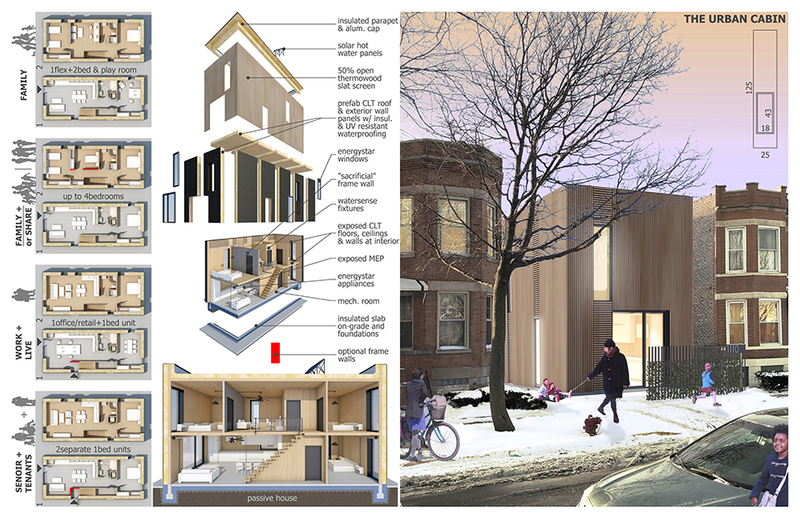 The “sideways house” suggests a new paradigm for Chicago’s 25’ wide by 125’ deep typical lot. The house is turned to face a ten foot wide linear garden running from street to alley. The house is considered as six 20’ long modules with an overall length of 120’. From street to alley the parade of uses are: 1. second bedroom/second living unit, 2. kitchen/storage, 3. living room, 4. master bedroom, 5. open garden, and 6. workroom/garage. Structure/Enclosure: Celebrating the beauty of a balloon frame, the structure and enclosure are defined by a series of square 2X wood frames at 16” centers. The frames rotate from 10 degrees towards the garden at the street to 10 degrees away from the garden at the alley. The surfaces defined by the rotation of the frames define a doubly curved surface, the resulting structural integrity allows for a reduction in the depth of each frame and the thickness of the plywood insulated sandwich panel sheathed in metal. This integrity will allow each 20’ module to be factory built and delivered to the site fully finished. Experience: The internal functions including storage, plumbing fixtures, and cabinetry run down the center of the house, leaving the wood frames free to carry on their highly sculptural choreography. The intent is both delightful and simple. The Disruptive Design competition is generously funded by Freddie Mac, Related Midwest and the Polk Brothers Foundation, with additional support from Chicago Community Loan Fund, Chicago Neighborhood Initiatives, Community Investment Corporation, The Resurrection Project, Enterprise Community Partners, LISC, Metropolitan Planning Council, Neighborhood Housing Services, Northern Trust and Woodstock Institute.